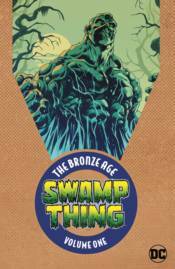 Swamp Thing's early adventures are collected in paperback with SWAMP THING: THE BRONZE AGE VOL. 1. Deep in the bayou of Louisiana, far from civilization's grasp, a shadowed creature seen only in fleeting glimpses roils the black waters...a twisted, vegetative mockery of a man...a Swamp Thing! These are the tales that introduced Alec and Linda Holland, Anton Arcane, Abigail Cable, the Patchwork Man, the Un-Men, plus an appearance by Batman! Collects THE HOUSE OF SECRETS #92 and SWAMP THING #1-13.